Ansible is a very simple yet powerful alternative to Puppet and Chef. It works over plain SSH and does not require an agent on the remote nodes. This makes Ansible very handy in automating tasks on XenServer hypervisor which is essentially a vendor black box. Below is a very hackish playbook to apply predefined XenServer hotfixes. It would be a lot cleaner if a “xen” module existed for Ansible. 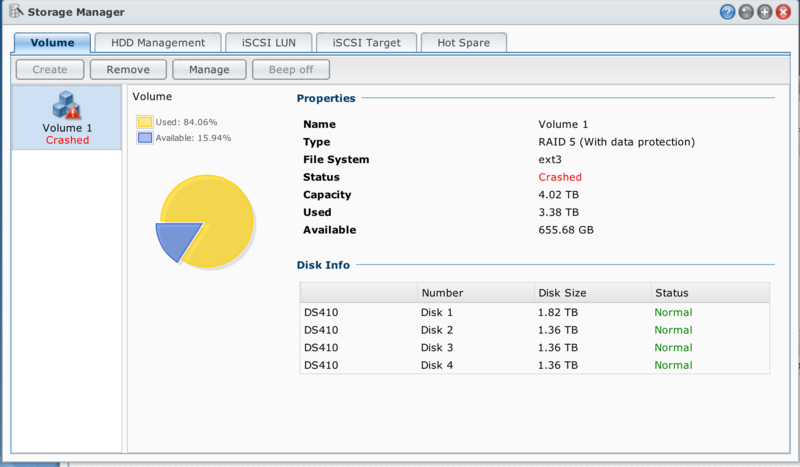 One of the 1.5TB WD15EARS (Western Digital Green) drives on the Synology DS410 running firmware DSM 4.2-3211 failed earlier this week. The RAID5 volume recovery process ended up being a little tricky thanks to ext3 journal corruption on the actual filesystem “/volume1” block device /dev/md2. The Working with Templates section from the CloudStack Administrators Guide describes in broad strokes how to create OS templates. In addition to the steps mentioned there, you might need an extra step to update the hostname settings during DHCP depending on the Linux distribution.